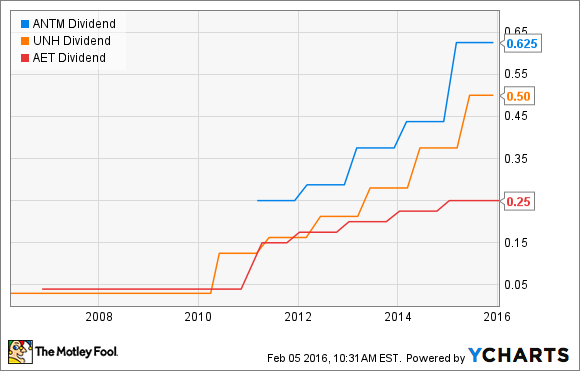 Will Anthem Raise Its Dividend in 2016? This is a key question for income investors, and the answer is less clear than the health insurer's history would suggest. Since instituting a dividend in 2011, health benefits company Anthem (NYSE:ANTM) has consistently increased its payout once annually in the first quarter. Now, at $0.625 per quarter, the dividend is more than double that initial $0.25 quarterly payout.. The key question for income investors is simple: Will Anthem raise it again? A dividend more than doubling over a period of four years is impressive, and you'd think Anthem would want to protect its reputation as a steady raiser -- especially given that its major competitors UnitedHealth Group and Aetna (NYSE:AET) have longer payout histories and similarly impressive growth. Additionally, Anthem's dividend is well-covered by its free cash flow: The company has a 22% cash dividend payout ratio, according to data from S&P Capital IQ. I'd consider anything under 70% safe, and anything under 50% ripe for a substantial dividend increase, since the company clearly has lots of additional money that it could push into capex or dividends. But there's one big problem: Anthem's proposed $54 billion buyout of Cigna (NYSE:CI), which it plans to finance through $22 billion in public debt and term loans (in addition to picking up Cigna's $5.1 billion in debt). For a company sitting on $15 billion in debt already (compared to $62 billion in assets), that is quite a bit of leverage to take on. Notice that he said "maintain." Not grow. Not expand. Maintain. CEO Joe Swedish followed up on that by noting in Anthem's Q4 2015 earnings call late last month that "We remain committed to at least maintaining our current dividend." Those statements don't exactly fill me with confidence that a dividend raise is coming. Management at rival Aetna, which is trying to acquire Humana (NYSE:HUM) for $37 billion, pulled no punches in describing what would happen to its dividend while it paid down the debt it plans to assume. "We expect that we will maintain our current shareholder dividend per share until we reach our target leverage goals," said Aetna CFO Shawn Guertin. So it's not like Anthem would stand out from the crowd if it kept its dividend flat for the year (or even a couple of years). Given the capital outlays, it would be perfectly understandable. Regardless, we won't have long to wait; Mr. Swedish has indicated that the company will announce its plans for the dividend after its board meeting this month. And regardless of whether the dividend stays flat or grows a bit, there are plenty of reasons to like where Anthem's business -- which is increasingly diversified among fast-growing Medicare and Medicaid populations in addition to its traditional employer-based insurance -- is headed.